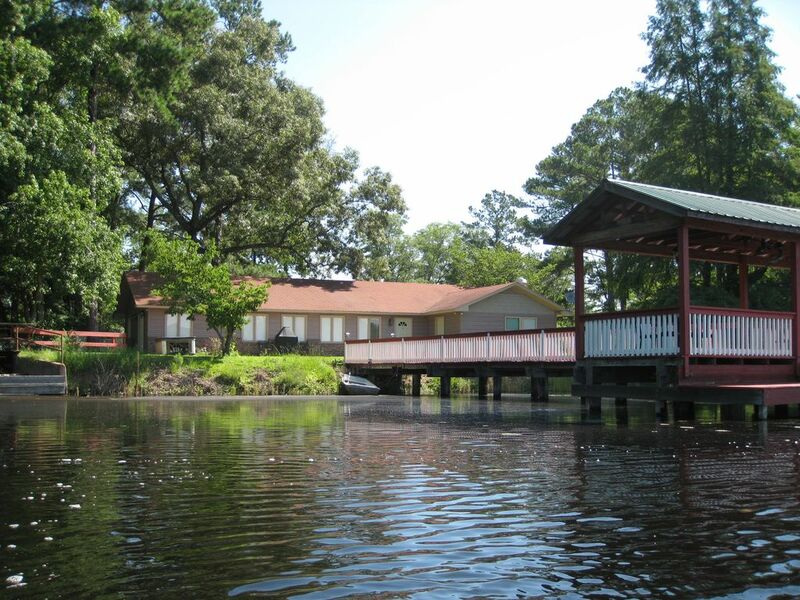 THIS PROPERTY IS LOCATED IN STATESBORO, GA! PLEASE CONTACT US FOR THE WEDDING RENTAL RATE BEFORE BOOKING!!! COME RELAX AND EXPERIENCE SOUTH GEORGIA !!! Take a break away from the hustle and bustle of city life. This vacation home offers a place to get closer to one another. It's where family and friends can take a break, reconnect and reminisce. This home has four bedrooms, 2.5 baths, and a fully equipped kitchen. It is situated on a 35-acre pond, stocked with lots of bass and brim, which makes for a great fishing experience when water levels permit. It also offers beautiful landscaped grounds with a newly installed gazebo and plenty of space indoors and outdoors for family gatherings and fun. Enjoy the pond view from the back patio and dock and listen to the sound of rushing water over the dam. You may catch an early morning glimpse of the otters playing in the pond. Visit nearby Statesboro, GA - where you can find plenty of shopping, lots of fabulous restaurants, golfing, and a water park. This vacation home is just 10 mins. from the city of Statesboro, 15 mins. from GA Southern University and Paulson Stadium, and one hour from Historic Savannah. NO ALCOHOL ALLOWED ON PREMISES! 20 minutes from shopping and excellent restaurants in Statesboro,GA. 30 minutes from Paulson Stadium and GA Southern Univ., 60 minutes from Historic Savannah, GA. Spacious interior and exterior. A beautiful and private location. Seven of our family stayed there this weekend. It was just right for us. We enjoyed the solitude and the natural surroundings. Looks like a great place to do some fishing next spring. Perfect getaway for our family. We stayed here for the weekend to attend a wedding 20 minutes away in Millen, Ga. It was nice for everyone to have their own room versus sharing a cramped hotel room. The house was nice and clean, and easy to find using Waze or the directions provided from the owner. We enjoyed the dock, and spent a lot of our time on the dock or on the back patio. The small dam is unique, and is very soothing to hear when relaxing outside. Overall we all enjoyed our stay, and enjoyed being able to be together in one place versus 2 or 3 hotel rooms for the wedding event. It gets 5 stars from us!! Was great for all our family very spacious. We had a great stay property is very nice and house meat our needs. The price for the amount of people that could stay at the property was great. The entire house needs a facelift especially the floor. When considering this rental some I reviewed previous reviews. Many of the comments were that the house was dirty. I asked the owner if she could make sure the property was cleaned before we arrived and she said yes. But I think the flooring being very worn and very dark/dirty looking in places makes the house feel dirty. The flooring is terrazzo and is just in bad shape. The deck over looking the water is nice. But overall not a bad place just needs some TLC. Very quite and very private!Great place to relax ! I use VRBO all of the time and have always had great experiences. Well, not this time!! The house was not clean. When you walked around with bare feet, the bottom of your feet were black. It had a mold and musky smell. The air conditioner did not work correctly in July in the South!! Because the air conditioner did not work, one of the bedrooms was over 85 degrees so we attempted to use the pull out sofa. When we opened the sofa, roaches were crawling everywhere. We obviously were not going to sleep with the roaches so my sister and her children left and drove back home that night. I prefer VRBO over a hotel room but don't make the same mistake as we did. Get a hotel room because this house it terrible!! Water Park and Georgia Southern University's Paulson Stadium in nearby Statesboro. Ogeechee River just a few miles away.